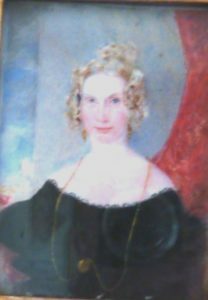 Mary Shaw Hellier was born on 27 February 1801, the third daughter of James Shaw-Hellier of Wombourne. She was baptized at St Thomas’s Dudley on 21 April 1801. She spent some of her early childhood on the estate at Barnhurst, as well as her grandfather’s house, the Wodehouse Wombourne. Her parents had been enriched by the legacy of Sir Samuel Hellier in 1786 and she herself was left a considerable amount of money by her Grandfather, Rev Thomas Shaw-Hellier by his will of 1812. On 2 March 1824 she married Richard Evans, whose family were important owners of Inn Keeping and Coaching businesses in Wolverhampton. Probably at the time of the marriage the family together with her father-in-law moved to Pendeford Hall, a neighbouring estate to Barnhurst owned by the Fowler family. In 1837 she is cited in a law suit brought about to decide upon the interpretation of her grandfather’s will (Evans v Hellier, Shaw v Rhodes). The case was basically between her brother Thomas Shaw-Hellier of Rodbaston Hall and the other eight surviving grandchildren of Rev Thomas Shaw-Hellier. The fortunes of the Evans family seem to have taken a turn for the worse after the death of her father-in-law, Richard Evans (Snr) in 1841. The advent of the railways meant that the family abandoned the coaching business but despite Mary Evans credentials as a member of the local landed gentry making money from farming alone was not a viable option. By 1852 her brother Thomas moved back to Staffordshire to nearby Rodbaston Hall. Nonetheless, the family left Pendeford Hall at about the time of her husband’s death in 1859 and she continued to live in nearby Tettenhall with a number of her unmarried sons until her death on 6 Dec 1878. 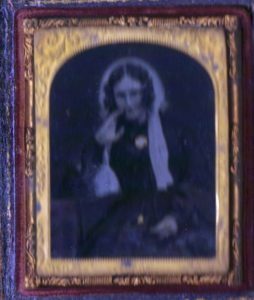 We have two likenesses of her – the attached daguerreotype and the other portrait which is one of a pair of her and her husband Richard Evans by an unknown artist.